Mason jars are everywhere and my theory is that everything tastes better out of a mason jar. They’re just so nifty and thrifty! I’ve been known to throw flowers in them too to spruce up our apartment. 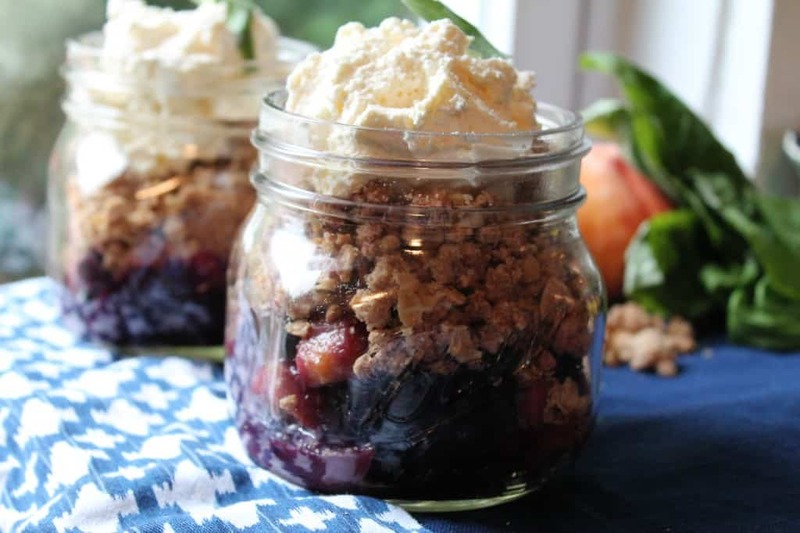 This month, our recipe redux challenge was to “raise the bar on food in a jar.” I’m a huge fan of desserts in a jar so I decided to take advantage of the produce of the season and make a blueberry peach and basil crisp with whole wheat crumble and Greek Yogurt whipped cream. Make whipped cream ahead of time and store in the refrigerator. With an electric mixer, whip cream, vanilla and maple syrup until peaks, then fold in Greek Yogurt. Preheat oven to 375 degrees. 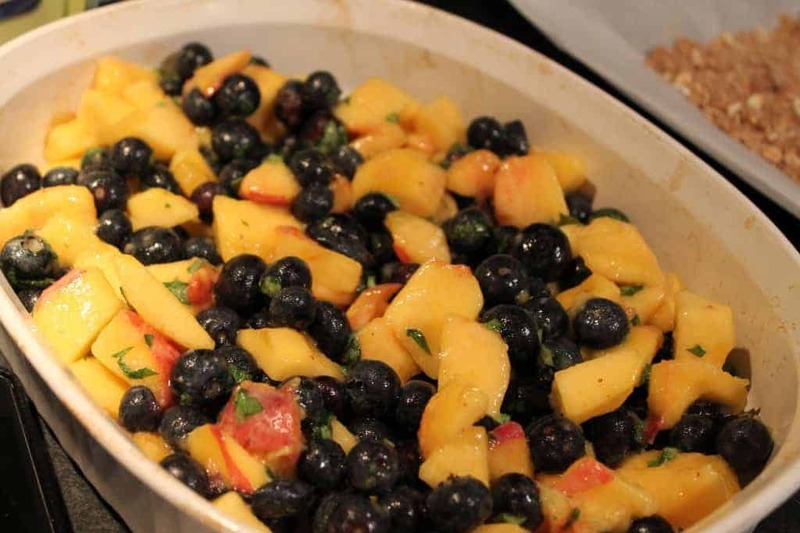 Mix blueberries, basil, peaches and sugar in oven safe dish and cook at 375 degrees for 25 minutes. Meanwhile, mix oats, flours, sugars, salt, cinnamon and salt in medium sized bowl. Add melted butter and combine until forms crumbles. Bake at 375 degrees for 15 minutes. Once everything is out of the oven, you can start assembling your jars! This looks so fabulous, I’ll have to give it a try ASAP! 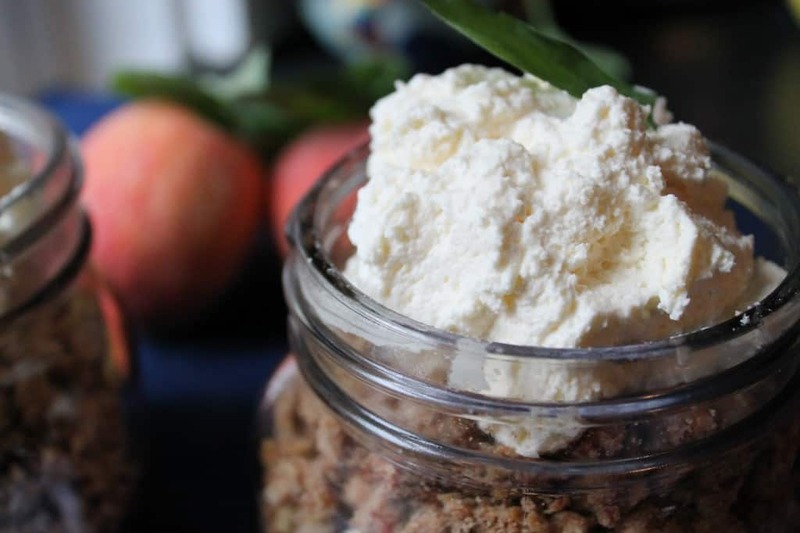 And maple Greek yogurt whipped cream, my mind is blown, I’m sure my palate will be too! The addition of basil sounds delicious, so creative and yummy!